Until now you have been asked to choose, manual or automatic. The Oracle is the worlds first automatic manual espresso machine that brings true café quality to your home without the barista. The Oracle has automatic grinding, dosing, tamping and milk texturing, automating the most difficult parts of manual espresso. At the heart of the Oracle is it's dual stainless steel boiler triple heat system. The Oracle has a dedicated espresso boiler with PID technology to extract the espresso shot to within +/- 1°C of the selected temperture. The Oracle also has a dedicated steam boiler to deliver instant and continuous steam on demand. You can extract espresso and texture milk simultaneously allowing you to capture the delicate aromatics of the espresso in your coffee by having the espresso and milk ready at the same time. The Oracle also features an Over Pressure Valve. This commercial feature limits the maximum pressure throughout the extraction, helping to prevent bitter flavours in the shot. It also has true low pressure pre-infusion, which gradually increases the pressure to gently expand the grinds for an even extraction. The Oracle provides the taste benefits of a manual with the simplicity of an automatic. Dual Boiler A specific brew boiler delivers more precise temperature to, and through the extraction, ensuring optimal flavor. With a second and seperate steam boiler for simultaneous and instant steam. Low Pressure Pre-infusion Low pressure pre-infusion gently delivers water pressure at between 2 to 4 bar to allow the coffee grinds to expand prior to extraction at the optimal full pressure of 9 bar. This enhances the release of the oils to produce a balanced espresso. This pressure and its duration is user programmable. Integrated Grinder Limiting the time between the grinding of fresh beans and extraction captures those oils that lead to an incredible crema. The in-built grinder allows beans to espresso in under a minute. Programmable Semi Automatic The programmable pour, or semi-automatic function, simply controls the volume of the espresso pour, at the press of a button. That's 30ml for a single shot and 60ml for a double. Which, of course, is adjustable. 15 Bar Pump Extraction is driven from a 15 bar Italian made pump. The quicker you pay, the quicker we can dispatch your item. Every item will be trackable. Please note you must have all original packaging in order to return any item to us. If an item has been used and damaged, we will not be held responsible and will not accept a return. We will get back to you as soon as we can. The item "NEW Breville The Oracle Coffee Espresso Machine Stainless Steel BES980BSS" is in sale since Monday, January 7, 2019. 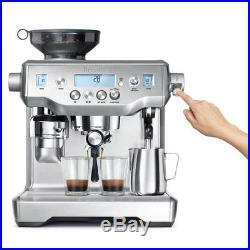 This item is in the category "Home Appliances\Coffee & Tea Makers\Espresso & Cappuccino Machines". The seller is "sparklingaccessories25" and is located in VIC. This item can be shipped worldwide.